Once you have verified that EurekaLog's code and data was added to your executable - you can start to diagnose what is wrong at run-time. 1. You have assigned Application.OnException event handler or have used TApplicationEvents component (VCL.AppEvnts unit). When you assign Application.OnException event (this is also what VCL.AppEvnts unit does) - EurekaLog assumes that you want to handle exception by yourself. You may remove your Application.OnException handler (and remove VCL.AppEvnts unit) or call EurekaLog manually from your handler (call HandleException routine from EBase unit). 2. 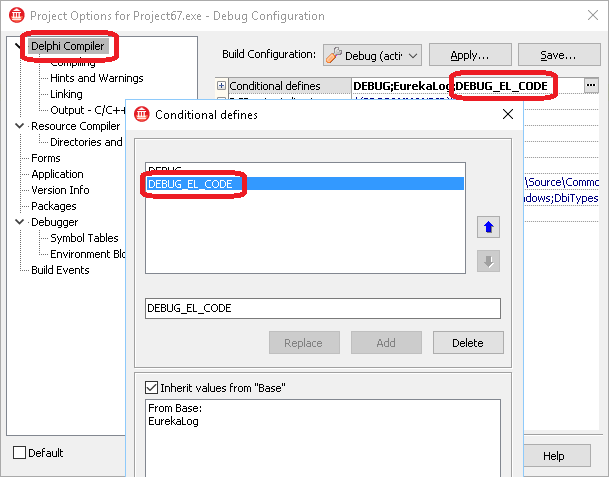 You dropped TEurekaLogEvents component on the form but did not enabled EurekaLog for your project via "Project" / "EurekaLog Options" menu. TEurekaLogEvents component is supposed to react on EurekaLog's events, but it does nothing if EurekaLog is not added. Please, enable EurekaLog for your project as explained here. Additionally, EurekaLog contains self-debug code which helps you to diagnose problems with EurekaLog itself. Usually this debug code is used when you're not able to debug your application directly. For example, when your application stop working after protecting it with EXE protector tool. If you pack or protect executable - it usually will not work under debugger. That's when you can use debug code to find out the reason. 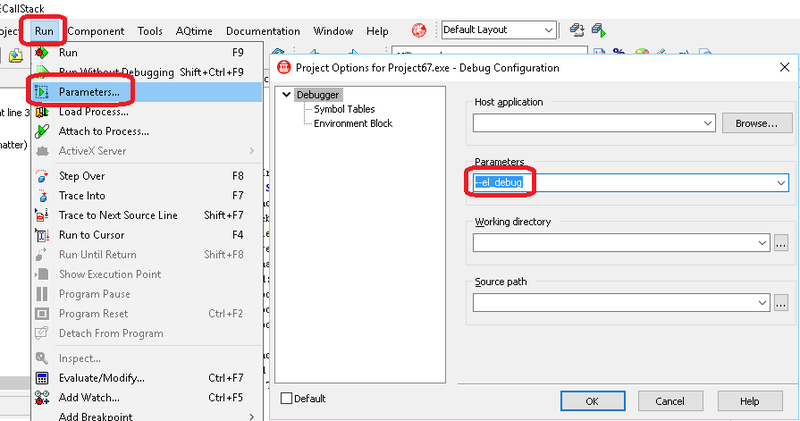 • If you're using precompiled files (default): go to Project / Options and turn on "Use Debug DCUs" option. Alternatively, you can add explicit search path to C:\Program Files\Neos Eureka S.r.l\EurekaLog 7\Lib\Win32\Debug\Studio11\ (change the path to match your installation and IDE version). 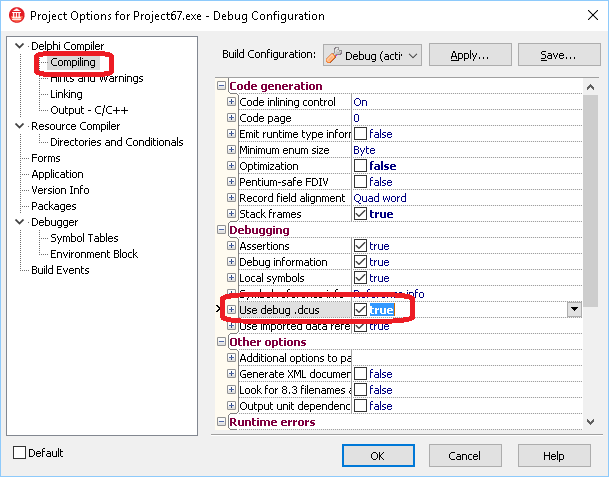 • If you're using recompiled files (for Enterprise only): be sure to enable "DEBUG_EL_CODE" conditional symbol in project options. Important: Be sure to make a full rebuild of your project (not just simple compile). First, make a normal run with normally working application. Run your application with --el_debug command line option. This option will turn on debugging code in EurekaLog. Debugging code will capture and log information about EurekaLog's work during application life time. • --el_debug_unique option will create one file for each EurekaLog module with unique name (your-exe-name_el_debug_date_GUID.csl). • your-exe-name-el_debug_unique (e.g. Project1.exe-el_debug_unique) as analog for the --el_debug_unique option. The content of the file does not matter, EurekaLog will simply check if such file exists. If it does - then EurekaLog would act as if you has passed corresponding command-line option. Note: Logging may affect performance of your application. Your application may run slower than usual. This is a normal behavior. 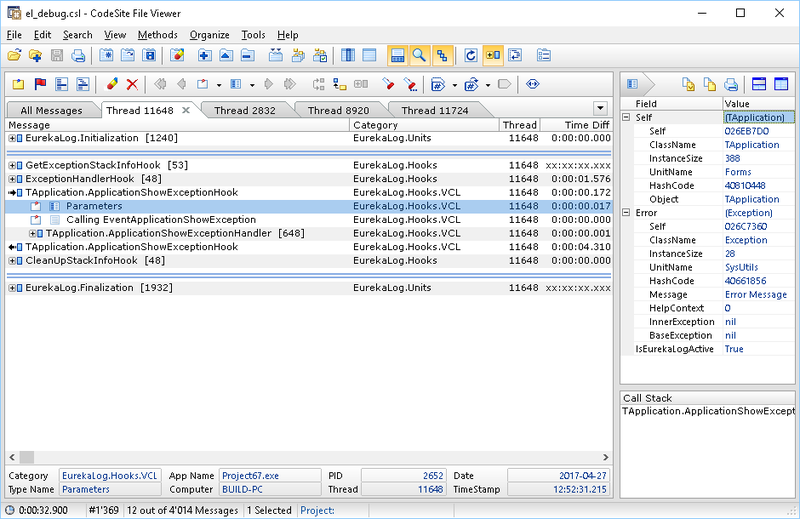 Alternatively, you may use DebugView tool. Download and run DebugView tool, then run your application with any of --el_debug command line options. The DebugView tool will display location for debug output file. Now, recompile your application with problematic configuration. Run it and make sure it doesn't work as expected. Then run your application again with any of --el_debug command line options. This will produce a new .csl file. Note: each run will overwrite .csl file. Be sure to rename/make a copy before running application next time. Or use --el_debug_unique option. You can compare two log files which were captured from working and non-working application. Find the differences. Differences will indicate what was going wrong. EurekaLog produces .csl file - which is compatible with Raize Software's CodeSite File Viewer tool. CodeSite File Viewer tool is shipped with recent versions of IDE, you can install it during IDE installation or via GetIt. Alternatively, you may download a free CodeSite tools from Raize web-site. See also for more details. • It is a good idea to organize log messages by threads. Additionally, you may organize by categories. • EurekaLog simply streams log to CodeSite-compatible file format. However, it is not a replacement for CodeSite. It does not support dispatching (e.g. Live Viewer, Controller, destinations, TCP, etc. ), EurekaLog does not have many CodeSite features. • While you may use EurekaLog for your own logging, you may want to use a proper logging framework.